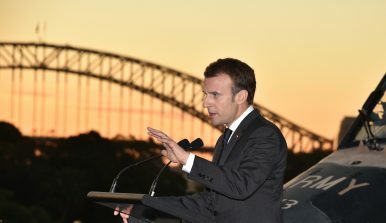 France's President Emmanuel Macron makes a speech on board the Australian ship HMAS Canberra in Sydney (May 2, 2018). A few weeks before a historical meeting between Donald Trump and Kim Jong-un, with major developments going on around the Korean Peninsula, the future of Northeast Asia is the focus of the world’s attention. Despite this, while visiting Australia in early May, French President Emmanuel Macron appeared oblivious of the close strategic connections between the Northeast Asian theater, where Japan is a major player, and the “Indo-Pacific axis” that he stressed during his trip. It was Japanese Prime Minister Shinzo Abe who, in 2007, launched the idea of a security network, based on common interests and values, with all the willing democratic powers. It is also Abe who relaunched the theme in 2012, after his return to power, around the concept of a “security diamond” comprising the United States, Australia, India, and Japan. This format is also the basis for the resurrected Quad discussions between these major players in the region. Confronted with an increasingly ambitious and aggressive Chinese strategy since Xi Jinping came to power, the region’s democratic powers, who had been hesitant for a long time, have rallied behind this initiative. Beijing has a particular notion of strategic balance in Asia, based on the rejection of the concept of universal values, a determination to move the lines on international norms, and the goal of eventually excluding the United States in favor of a “community of destiny” for Asia. Against this China-centered vision, Japan proposes a much more balanced networked security architecture between equal partners contributing according to their capabilities. Given this context, the omission of Japan in Macron’s speech on the Indo-Pacific conveys a worrying lack of awareness of strategic issues in Asia. A truly global strategic vision, for a power like France, should go beyond a block by block construction based on the conclusion of contracts, as important as they are. Nevertheless, it seems that Macron’s aspiration to place France “at the heart” of an axis connecting Australia to France via India had as its primary logic the negotiation of significant arms contracts with these countries, more than a global consideration of the situation in the area as a whole. Moreover, this stress on the Indo-Pacific “axis” is also inconsistent with the China policy expressed during the president’s visit to Beijing in January 2018. The choice of China as Macron’s first destination in Asia was explained by the “Great Power” status of China, a member of the UN Security Council and the second largest economic power in the world. French diplomacy also remains influenced by a Chinese “neo-Gaullist” tropism and the weight of large companies that believe the People’s Republic of China (PRC) must remain the most important partner of France in Asia. However, Macron went further, promising to go “every year” to Beijing and mainly answering to (or perhaps even exceeding) the expectations of the Chinese leadership. In that context, Macron’s recent speech at a naval base in Australia, which went far past the commitments he made in India, proclaiming that France, Australia, and India have the responsibility to protect the region against the risk of hegemony can only upset Beijing, was significant. To the Chinese leadership, the idea of an “Indo-Pacific” architecture, involving the United States, is to hedge against China’s rise is anathema. At the same time, Macron’s omission of Tokyo, whose security role in the region, including in terms of capacity building, is increasing, with the support of all regional powers except China, could also have damaging consequences for the future of the Franco-Japanese relationship, and therefore on the real place given to France in the region. Unlike Beijing, Japan does not pose any threats: it is not a permanent member with veto right at the United Nations Security Council; and it may not be good at offering commercial contracts that allow for important announcements during official visits. Decision-making can be slow, as in any democracy, and the government does not have the means to impose decisions on companies. Finally, any relationship with Japan — including in its economic spin-offs — can only be built in the long term, taking into account the constraints faced by Tokyo, particularly in its defense relationship with the United States. Japan occupies a significant place in the French economy, both regarding investments and job creation. Japan remains by far the first among Asian investors in France. As of 2018, 490 Japanese companies employed nearly 80,000 people in diversified sectors, a figure far above the 17,000 jobs created by Chinese companies, Hong Kong included. Japan might be now the third economy in the world, behind China, but it remains a rich consumer country, where France has major trade interests. Consumption growth, particularly for luxury goods, is, by nature in a mature economy, less impressive than in China, though political uncertainties and the anti-corruption campaign put a massive blow to that sector. But if Beijing represents 5 percent of global French exports, and Japan only 1.4 percent, it is also with China that our deficit is the largest, five times more than with Japan. Regarding real innovation, Tokyo remains far ahead of China, both in qualitative and quantitative terms, and bilateral cooperation in this area can be more balanced and confident for French companies than with China, which has a state-sponsored policy of imposing technology transfers as a major element of its own capacity building. At a more strategic level, Japan recognizes and appreciates the position of France as a “Pacific power,” the only one inside the EU, and the French ability to maintain a balance vis-à-vis China’s increasing influence in the Pacific. Paris hopes to develop a bilateral dialogue with Tokyo, on matters like cooperation in the maritime domain, climate change, or the role that Japan could play to support the autonomy of France’s Pacific territories. Japan also remains an essential provider of development aid, and its role in stabilizing Africa, based on values that France shares, is far from negligible. In these circumstances, Macron’s endorsement of the Indo-Pacific concept, long anticipated by Tokyo, is positive; but it is unfortunate that Paris did not perceive the need to fully integrate Tokyo, and to connect more coherently the two poles of France’s Asian policy: Northeast Asia and the Indo-Pacific axis. 2018 marks the 170th anniversary of diplomatic relations between France and Japan, and the 100th anniversary of the French Chamber of Commerce, the oldest in the archipelago. However, beyond this long history and the importance of cultural exchanges around the theme of “japonism,” it is time for France to become truly aware of the major economic and strategic role that Tokyo is playing in the region and beyond. Dr. Valérie Niquet is head of the Asia Program at the Foundation for Strategic Research and a Senior Research Fellow at the Japan Institute of International Affairs. Why the French elections will be important for the Asia Pacific region as a whole. What About Asia? The Hole in the French Presidential Election DebateMacron and Modi: What France Can Do For India and What India Can Do For FranceMacron to Set Tone for an EU Balancing Act Between India and China on Belt and RoadFrance and China's Green Silk RoadsWhy Did France's Macron Start His China Trip in Xi’an?